This book offers a novel approach for the study of law in the Judean Desert Scrolls, using the prism of legal theory. Following a couple of decades of scholarly consensus withdrawing from the "Essene hypothesis," it proposes to revive the term, and suggests employing it for the sectarian movement as a whole, while considering the group that lived in Qumran as the Yahad. It further proposes a new suggestion for the emergence of the Yahad, based on the roles of the Examiner and the Instructor in the two major legal codes, the Damascus Document and the Community Rule. 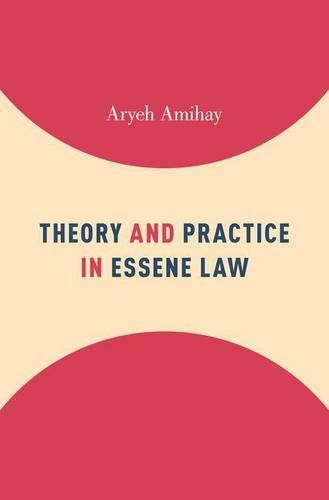 The understanding of Essene law is divided into concepts and practices, in order to emphasize the discrepancy between creed, rhetoric, and practices. The abstract exploration of notions such as time, space, obligation, intention, and retribution, is then compared against the realities of social practices, including admission, initiation, covenant, leadership, reproof, and punishment. The legal analysis yields several new suggestions for the study of the scrolls: first, Amihay proposes to rename the two strands of thought of Jewish law, formerly referred to as "nominalism" and "realism," with the terms "legal essentialism" and "legal formalism." The two laws of admission in the Community Rule are distinguished as two different laws, one of an association for a group as a whole, the other as an admission of an individual. The law of reproof is proven to be an independent legal procedure, rather than a preliminary stage of prosecution. The methodological division in this study of thought and practice provides a nuanced approach for the study of law in general, and religious law in particular.